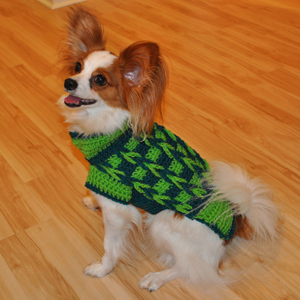 Some people think it is silly to dress a dog, but there is evidence that in many situations, letting your best furry friend make a fashion statement by sporting a dog sweater or shirt, can be very beneficial. Of course, if you have a large, northern breed, such as an Alaskan Malamute, you don’t need to worry about your dog getting chilled in cold weather. Chances are, your dog loves to play in the snow every chance he gets! 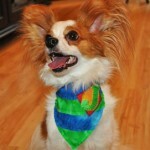 So how do you know if your dog is a good candidate for doggie apparel? The common denominator with all these dogs is that it is much more difficult for them to generate and maintain body heat. 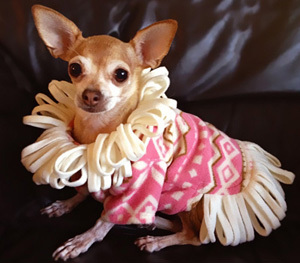 Yes, it is true that dogs are equipped with their own external layering system, but some dogs have lighter layers or may not be genetically suited to the environment in which they live. At my house live two very spoiled Papillons. They have plenty of fur, but still show signs of being uncomfortable when it comes time to venture outside in the cold to do their business. They need clothes to keep them warm on those chilly nights out. I design and construct all their clothes, crocheting and sewing fleece sweaters, jackets and T shirts, so they stay comfy cozy while showing off their unique style. 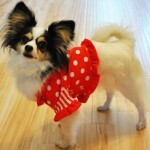 I happen to believe being stylish and comfortable are certainly wonderful reasons to dress your dog. 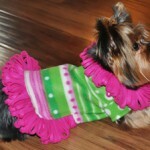 Another benefit I have found in dressing my dogs is that many times it actually calms them down. A few years ago, I noticed that when my dogs wore these particular fleece sweaters I had made them, they tended to be less hyper (especially Jasper, who is normally quite the little maniac). One of my friends, whose son is autistic, told me this could be working similarly to a firm pressure technique used to help calm autistic children. I found this quite fascinating. The sweaters were snug and it did seem to help relieve their anxiety, especially during a storm or when the house was full of unfamiliar guests. I have absolutely no scientific evidence to support this idea, however, it was not that long ago that a pressure type jacket came out on the market claiming it will calm your dog. So there may be something to it after all! 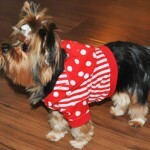 There are so many just over-the-top adorable dog clothes available today, but many come with a hefty price tag. 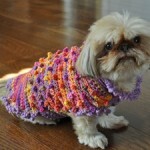 If money is no object, shopping for designer doggie duds is not a problem. 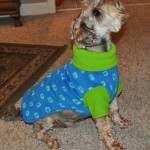 However, many dog owners may be on a tighter budget, and/or like me, just love to make apparel for their dogs. 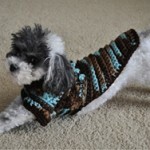 If you would like to make some cute, original clothes for your small dog, Stitchwerx Designs is the shop for you. 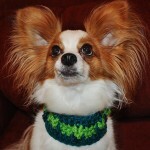 I currently have several crochet small dog sweater and collar patterns in my shop along with sewing patterns for unique bandanas, T shirts, and fleece sweaters. 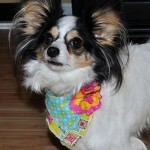 My patterns are geared towards small dogs, but the bandana patterns can be printed to fit any neck size. 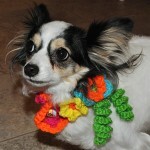 Here are some of my favorite little canines showing off their style. 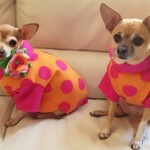 The bottom line is, in my opinion, dressing your dog can be quite beneficial in many cases, and it certainly can’t hurt in most situations. Would I take my fur babies out on a hot summer day in a sweater? Well, no, but that does not mean they can’t sport some very stylish bandanas while strolling through the neighborhood in the summer heat. 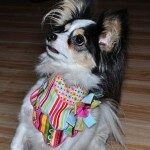 And in the fall and winter, you can be sure my Jasper and Lily will be the best dressed papillons in town! 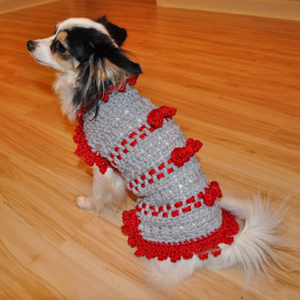 This entry was posted in Crochet, Dog Clothes Patterns, Dogs, Sewing and tagged dog clothes, dog clothes benefit, dog fashion, dog sweaters, dog t shirts, dogs in winter, small dogs. Bookmark the permalink. I am now blessed with a rescued Maltese little lady who is of the same silly attitude about clothes! My family doesn’t believe that it is she who actually brings a piece of clothing to ME to put on her!!! Must have something to do with her happiness; certainly makes me smile to share her love!